Operating from several decades as a consultant for the management, positioning and evaluating the brands, Interbrand is a reality that has the ability to have a single view of the main brands in the world, elaborating on an annual basis a ranking for the evaluation of 100 most valuable brands. The Best Global Brands ranking is based on an evaluation system created by the same Interbrand since 2010 and that it is compatible with the ISO 10668 standard for the valuation methodologies of a brand. In this article you will read an extract of this ranking with particular attention to those companies in the world of technology that have found their place among the 100 most valuable global brands in 2013. 2013, which represents a year in which they reaffirm with vigor the changes and paradigm shifts whose first signs occurred in previous years. Changes that call into question the concept of “leadership” : the frantic pace of technological advancement, the digitalization of almost every aspect of life and the interdependencies intertwined within the global market over the past two decades have triggered a transformation of the business landscape where it is needed to move forward more quickly and where there are just few certainties now. Who is now in the difficult and exciting position to conduct a brand can no longer afford to rely on truth once and immutable principles of leadership or those honored in the past. It is needed to put in place a new awareness and new skills, especially in a scenario where the shopping experience of consumers is moving more and more from real to virtual and interactions between consumers and brands evolve from a purely transactional to a relationship type. The advent of social media has given rise to a new truth : today the brand has forged increasingly from consumer opinion and demand, and it is less and less under the control of the company. Many brand discover at their own expense as something as seemingly insignificant as a tweet published with inaccurate timing, can trigger a tornado of negative publicity. The exposure on social media, however, must be approached in the right way, since in today’s hyper-connected world consumers discover that if the brand is not doing what it claims to do, he could ran into a big failure. The exposure to the public must become an opportunity to establish a deeper connection with it. Consumers can become allies of inestimable value, if the brand proves to be capable of responding to the problems instead of avoiding them or removing them. Establishing a real dialogue with the public helps companies to learn a lot about what he wants, to know his ideas and gather insights that can improve products and user experience. Last year, technology brands in the top-100 were 27. This year you can see the classification of Yahoo! and BlackBerry, which last year had conquered the little commendable scepter of the brand that has lost more value. If you limit the quantitative analysis of the top ten positions, instead you see 6 brands operating in the technological landscape, two of whom sit in the top two of the standings : Apple and Google. 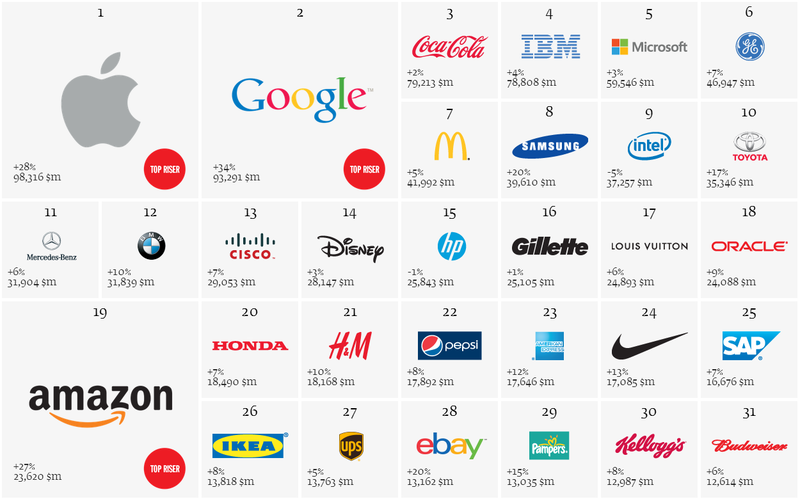 Check the complete list of 100 Big Brands 2013 here. The Apple brand is confirmed for the second consecutive year the most valuable in the internetational landscape and, for the first time since the Best Global Brands ranking is drawn up, it also becomes the most valuable brand in the world by ousting Coca- Cola for 13 years dominated the rankings. Last year, it was full of new challenges for Apple, with the advance of Samsung as a manufacturer of more profitable smartphones, the expansion of Android and the interest around Windows 8. Bringing up the rear among the brands of technology there is Adobe, whose brand still registered a growth of 8 % to almost $ 4.9 billion. Other than the first 2 winners, there are other technology brands worthy of mention. Between those who see its value grow the top three are Facebook, Google and Amazon, while the three ” black shirts ” are Nokia (-65%), Nintendo and Dell. As a Apple fan boy I am happy to see Apple at the top! 🙂 But I am sad that Nokia is at the bottom. My first mobile phone was a stable Nokia phone. I am located in Sweden, so it is interesting to see that H&M and IKEA are two of the best global brands. Which is your favorite global brand? I remember 20 years ago when I bought my first mobile phone, it was a Nokia.